With Andy Diggle taking over the writing duties on Daredevil, starting with the Dark Reign: The List tie-in in September, I saw it as my duty to take a look at the writer’s previous and ongoing work and post some of my thoughts. So far, I’ve been following Diggle’s Dark Reign: Hawkeye mini and his run on the Thunderbolts. I’ve also read the trade collecting the stand alone mini-series Hellblazer: Lady Constantine and his own creation, and the subject for this post, The Losers. It’s been a very fun ride so far and I feel convinced that Diggle is perfectly capable of pulling off a Daredevil that might just be different enough to give the title the shot in the arm that even a sworn Brubaker fan like myself is beginning to feel that it needs, while staying in the familiar milieu that has made the character so successful. But this post isn’t about Daredevil specifically, but about The Losers. So, let’s get on with it, shall we? I’m going to start by going off on a brief tangent and admit that I was a huge fan of the first couple of seasons of Prison Break. It had intrigue, action, and a smart plot that connected the little people to the big players with the big guns in unexpected ways. There were clever twists in every episode that managed to surprise the viewer without seeming too contrived. The show was a smash hit, so much so that its life span kept getting extended with one season after another while the plot began to suffer. Eventually, I gave up. 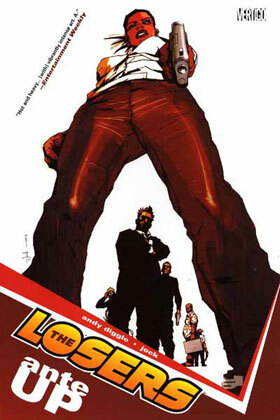 Reading The Losers was, for me, an experience reminiscent of watching the first two seasons of Prison break, equipped with the timely ending the television show didn’t have (to those still watching it, did it ever get back on track?). Starring an eclectic former black ops team who turns on their mysterious CIA handler when left for dead in Afghanistan while on a mission, the thirty-two issue series is smart action at its best. Diggle manages to pile layer after layer of intrigue without ever confusing the reader, and that’s quite a feat with a story this long and involving this many players. What impresses me the most, though, is how intelligent the writing is. It is all too often the case that, in order for the protagonists to seem appropriately cunning, their adversary by default comes across as completely incompetent. That is never the case here. Instead of leaving the “wait, that doesn’t work” bit to the scrutinizing reader, the writer in this case seems to have error-proofed every single scenario. That’s not to say that there aren’t fantastical elements to this tale, or improbable events and circumstances, but that’s in the nature of the genre, and this particular thrill-ride is free of contrived cop-outs and annoying plot holes. There’s an attention to detail at every juncture that keeps the story feeling real. Diggle also manages to keep the entire story very even-paced, and I can’t think of any passage where there is any noticeable dip in quality or tension. You can’t have a good story without great characters, and the group of flawed heroes are really the heart and soul of this story. They each have a distinct voice, and even distinct motivations for the goal they are pursuing, and they are all refreshingly rough around the edges. Some are downright unsympathetic. My personal favorite is Jensen, the computer whiz with a well-developed humorous side. In fact, the story throughout is quite funny and full of well-placed pop culture references and observational comedy. It’s hard to get into the details of the actual story without revealing some pretty juicy pieces of plot, but I’ll keep it brief by saying that this story should appeal to anyone with a soft spot for espionage, conspiracy theories and tales of greed and corruption. At the beginning of the story, the mission at hand for this group of “losers” is ambitious but relatively small in scope. As the story advances, the team passes many points of no return and gradually uncovers a very intricate scheme involving the highest level of government, all centering around their enigmatic nemesis Max. The story remains interesting even as we cross the finish line (and the last page is gold! ), but my only real criticism is that the climax of the story might be just a little too over the top. It’s not a huge issue for me as it fits quite well with the overall tone, but I feel it might have benefited from being just slightly less sensational. The Losers can be read and enjoyed as a straight up action adventure, but there is more depth to it than that for those who enjoy it. The story asks very relevant questions about who and what represents a nation and makes plenty of references to the longstanding American tradition of directly influencing events and regimes far outside of the country’s borders, and breaking the law in doing so. However, this is done in a surprisingly non-judgmental manner and without any of the heavy-handedness that one might expect. The story invites the reader to reflect, not make the kinds of simplified judgments about the nature of good and evil that so often stand in the way of intelligent debate. So far, I’ve said nothing about the art. This is because my main goal has been to examine Diggle’s writing and also because I know I’m not much of an art critic. I usually base my opinion of an artist’s merits on whether the art is easy to follow and visually appealing, the latter being a highly subjective measure. The artist on most of the issues contained in the five trade paperbacks collecting the series is Jock, and both he and the fill-in artists (who’ve all done a good job approximating his style) have managed to satisfy both of my criteria. The art is clear without being overly rich in detail, and very cool-looking. Yes, I know “cool-looking” isn’t a standard term, but it neatly sums up my general impression. I also really like Jock’s knack for mastering odd angles. All in all, this was a fun and impressive read and I would absolutely recommend checking out these trades (see below). You can also read the entire first issue for free on Andy Diggle’s ComicSpace site. There is also a movie version of The Losers currently in pre-production, and I’m curious to see if it will be able to deliver on the clever action of the original. Thanks for the review, Christine. I dropped Thunderbolts a few issues into Diggle's run so I'm a little nervous, but this sounds very interesting. Maybe I should check it out (to calm myself down). PS I've loved what I've seen of Jock's art here and elsewhere.